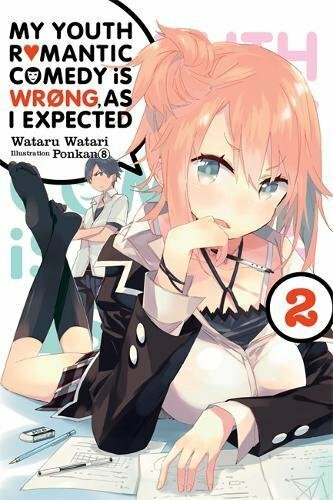 Welcome to the open forum for volume 2 of My Youth Romantic Comedy is Wrong as I Expected! Or Oregairu for short. For all who wish to participate, it’s about time to pick up a copy of this light novel… It’s already out! Synopsis: Hachiman Hikigaya’s life has changed little since being forced to join the Service Club. Sure, he now spends his time after school in the company of the icy Yukino Yukinoshita and bubbly airhead Yui Yuigahama, but his warped personality still ensures that he won’t wring a moment’s enjoyment from his insufferable school life. When someone starts trolling his class with hateful e-mails, though, and the Service Club is enlisted to help solve the case, Hachiman’s “unique” perspective as an outsider might finally come in handy…or he could still just be a loser. Once you’ve got your hands on the book, start reading it. And as you read it, feel free to leave any comments you have here–and respond to other comments. You can talk about whatever you want, so long as it’s related to this volume. Regarding spoilers: People will read at different speeds, and the main idea behind this open forum is to encourage people to comment whenever they wish. So feel free to talk about anything that happens in the volume, but maybe give a warning if you’re going to discuss a big plot twist. Also, if you’ve seen the anime or read the manga, try to keep your comments related to just the story in this volume. Thanks! In about a month there will be a big feature post for this volume. So look forward to that! But in the meantime you can share any thoughts you have on the volume here as you read it. Just ordered this one. Glad I had a B&N gift card and coupon :) I have been reading one print and one digital LN at the same time for a couple months now. Guess as soon as I finish my current ones it will be Oregairu and your name. Curious how often this comes out in Japan, since Vol. 1 came out all the way back in September. Sadly, there hasn’t been a new volume in Japan for two years now. The 11th novel came out in June 2015 and nothing new ever since. Let’s hope the new volume comes out this year. Chapter 1: Hikigaya’s inner monologue is always what makes me laugh about this series and continues to do in volume 2. Loved the joke about organizing the phone alphabetically. I am very particular about my contacts. Even my mom is written as her full name in my contacts. If someone added that it would be changed in a flash. Hmm so Hikigaya used to play strip Mahjong. A really big change happened in middle school, eh. Sorry I haven’t gotten around to writing an editorial for this yet. I have to put it on-hold for now, because life has been busy and will probably be even busier for the next couple weeks. I will definitely get to this when I can though! What I have read of the volume has been great so far. I think what stands out the most to me for now is just how funny it is. When people discuss Oregairu, it’s usually not about its humor — but the prose really does get some laughs from me. I’m always surprised by the mean or ridiculous things they write in the little reports and text messages that are placed between chapters, ha ha.